After calling her husband from the parking lot, the couple returned home. Despite driving her own car, she doesn’t remember being behind the wheel, but she does remember the sheer exhaustion she felt. Following a two-hour nap, her headache began to dissipate but nausea increased. The family decided to call their insurance company before going to the hospital, just in case it was nothing. The severity of the event wasn’t clear until the responding insurance caller emphasized that she needed to promptly get to an emergency room. The threat to Curran’s life began to take shape when EMTs wouldn’t let Chris ride in the back of the ambulance, confining him to the front seat; they didn’t think Brooke would survive the trip to the hospital. “There was so much blood in my brain by the time I got there they couldn’t find what was wrong,” she said. Curran endured multiple surgeries and an uncertain outcome in the ICU before her ultimate release. Doctors knew she had suffered a ruptured aneurysm, but the treatment for which is never simple and the results are never guaranteed. She now wears a talisman of a golden clothespin around her neck to symbolize the clip installed into her brain following the bleed. An estimated 30,000 Americans suffer a brain aneurysm rupture every year, only about 60 percent survive; the majority of survivors are left with disabilities. Brooke Curran’s recovery is nothing short of remarkable. 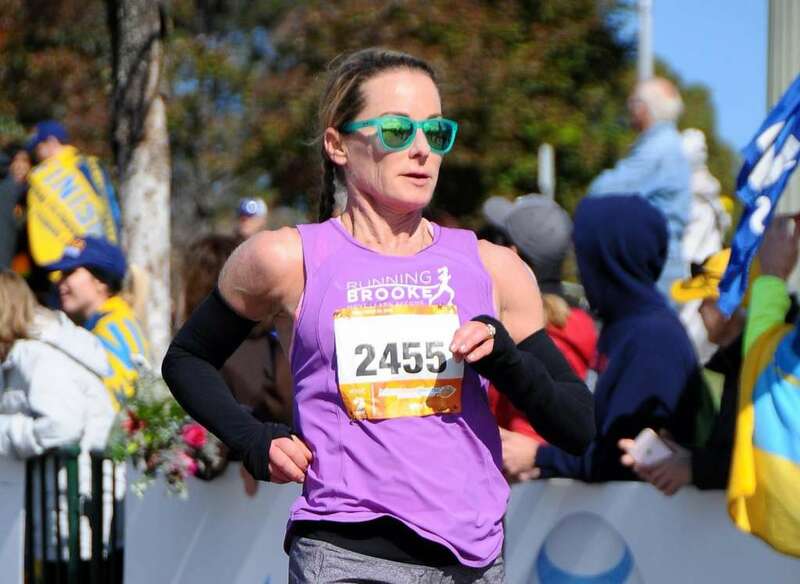 Nine years ago, Curran began to run a marathon every month as part of a challenge to raise funds for her nonprofit organization RunningBrooke. She has since finished dozens of marathons, including a race on every continent and every world marathon major. At first glace, her overall fitness could be perceived as an advantage to her overall survival. However, she shared that with her “strong heart and strong body, it was actually bad to be that healthy,” and more blood than average was escaping into her brain. Curran ultimately spent three weeks in the hospital and lost a total of 25 pounds during her stay, mostly precious muscle she has spent decades developing. RunningBrooke had to press on without the presence of its founder and namesake. The two staff members, board, and advisory committee successfully executed its spring fundraising event to raise over $120,000 in twenty-four hours. This Alexandria-based foundation is focused on getting kids to be more active both during and after school. As of spring 2019 they will have built three playgrounds and implemented programs like Move 2 Learn, which educates teachers on how to get students more physically active during classroom hours. Curran believes that by getting kids active they can stay more focused in the classroom and display more on-task behavior. Anecdotally, principals have reported that classrooms that implement more activity during the day, as encouraged by the Move 2 Learn summit, send fewer students to their office for negative behavior. Despite her aneurysm, Curran has no intention of slowing down. She came back to run both the Marine Corps and Richmond marathons, but in the initial weeks of recovery, she was still dragging the left side of her body and walking down the hall was a challenge. It would take her 25 minutes to cover a single mile. Now Curran feels that her muscles :had that memory, there’s a lightness and joy just being out there.” The parts of her brain that were damaged will always operate differently than they did pre-aneurysm, yet there is an element of relearning. Her sentences don’t flow as they once did and linear thinking is a challenge, but there is no other way to run than to continue on a line, placing one foot in front of the other. On the wall in the heart of RunningBrooke HQ, Brooke has three items pinned to a board over the communal table: the organization’s eight core values, a get well soon note from a student named Brandon, and the race bib from a 100 mile race she never finished in 2017 and was training to return to when the aneurysm happened.